The Geekbench listing of the Nokia 9 PureView that is scheduled to go official on February 24 has appeared today. The flagship phones from top brands arriving this year such as Samsung Galaxy S10 series, Xiaomi Mi 9 and LG G8 ThinQ are all going to be powered by the 7 nm Snapdragon 855 chipset. However, recent reports have revealed that the Nokia 9 PureView flagship phone by HMD Global will be featuring the Snapdragon 845 that powered most of Android flagship phones last year. 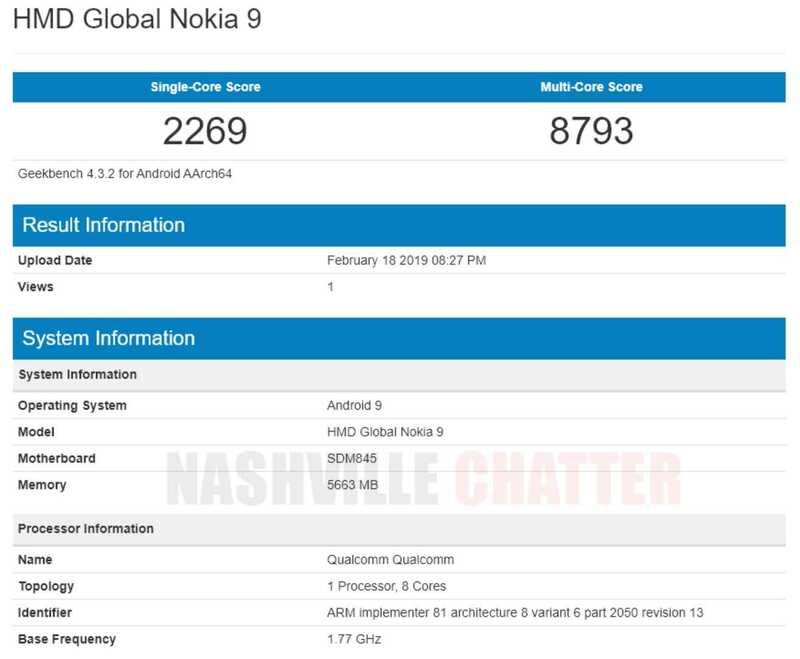 The Nokia 9 Geekbench listing is yet another proof that it will be powered by Snapdragon 845 mobile platform. The Nokia 9 Geekbench listing shows that the Snapdragon 845 chipset is supported by 6 GB of RAM. Also, the handset is loaded with Android 9 Pie OS. In the single-core and multi-core tests of the benchmarking platform, the Nokia 9 has respectively scored 2269 and 8793 points. Like the other Nokia phones, the Nokia 9 will be an Android One device that will deliver stock experience of Android 9 Pie OS. The arrival of the Nokia 9 PureView is confirmed since it has already bagged approval from various bodies such as FCC, EEC, CCC and BTSIG certification bodies. The handset is expected to come with 5.99-inch AMOLED display with support for Quad HD+ resolution and 18:9 aspect ratio. The display of the phone will be embedded with an in-screen fingerprint reader. The 6 GB RAM variant of the phone may feature 128 GB storage. Its base model may come with 4 GB of RAM and 64 GB of storage. It goes without saying that the major highlight of the Nokia 9 PureView will be its penta-lens camera setup which may include two 12-megapixel sensors, two 16-megapixel sensors and an 8-megapixel sensor. The smartphone is rumored to house a 4,150 mAh battery. Apart from rapid charging, it is likely to carry support for wireless charging.